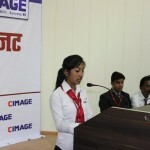 CIMAGE as an emerging excellence in the field of education believes in the complete participation of students in the development & amendment of Bihar state economy. We feel highly obliged to be the part of this state, wherein the state government has greatly worked in the development of our economy via several sectors. In this program, our students or the leaders in future have tried their opinions and suggestions to engage more developments in the Bihar state budget program. We believe that such suggestions, if liked & listed by the state government can also increase the rate of development in our state. The alternate budget program included the sectors of entrepreneurship development, higher & technical education, benefits for the assisting candidates with incentive schemes, school education, vocational skill development initiatives, improvement of the sports facilities, increase in employment opportunities, etc. Health sectors, industrial development, promotion of micro, small and cottage industries, energy sector, town development, women security, welfare & development, forest department, public health engineering department, e-governance, IT & ITES sector, Sales Tax Department, Trade e-commerce, Agriculture Sector, control over regional imbalance, Tourist Development, Bihar Police modernization, are few other notables in this category that can assure ample significance to the ultimate development of our state.